I’ve been stuck on how to improve our current assessment approach – we offer a five week open online course, based on the ISW (instructional skills workshop) model. We focus on reflective practice, encouraging personal reflection on learning, and participants are asked to provide constructive feedback to peers on shared learning and on the facilitation of a mini-session (each week features a mini-session activity on a specific topic ranging from adult learners online to facilitating teams effectively online). We’ve had some problems with persistence, consistent participation, and we’ve received some feedback from participants that suggests we should integrate a learning contract, put more time into clarifying the expectations of performance (especially as your lack of participation can so greatly affect your peers) and offer grades as a motivation to participate more consistently. The weakness of the openness of our approach (the 5 week course is free to BC educators and there are no prerequisites) and the depth of learning and practice we try to offer and support, is that participants may not fully commit to completion. I fully understand as I’ve found it challenging to keep up my commitment to this OOC because it doesn’t directly relate to my paid work currently and because, to do it well, requires a fairly significant investment of my time (not because the Storyboarding OOC is really demanding – but the analysis and contemplation required to fully engage with our course, while simultaneously trying to provide some useful feedback to other participants, is often challenging). 1. Our primary purpose (I believe) is to enable learners to experience the online learning environment from different perspectives (playing different roles) and to couple that experience with readings, advice from experienced and successful online instructors (through videos or writings) to develop and improve their ability to successfully facilitate online learning for adult learners. So we need to help them develop a framework to guide their ongoing development and improve their self-assessment of their practice. 2. How do participants currently assess their practice? Reflective Practice: Each participant is asked to set up a journal to collect their thoughts insights and challenges each week (5 weeks). They are also asked to review some sample rubrics used to assess student participation in online learning and to construct a rubric to help them assess their own participation against criteria and standards they establish (and can modify) as they progress through the course. Each week, participants will share “nuggets” from their journals (and, if they choose, from their self-evaluation using their rubric). They review and discuss in an online forum with their peers to encourage re-evaluation and, potentially, new insights. Participants take turns working in pairs or small groups to facilitate a mini-session on a pre-established topic that must be completed within five days (some flexibility). Constructive feedback from peers is shared in a discussion forum and the facilitators for each week complete a detailed survey to draw out their perceptions of their performance and to identify area they liked or would like to improve. Targeted feedback is provided by the course facilitators (private to each individual). No structured assessment is provided. – Ask participants to share their goals for participation and learning at the beginning of the course (not necessarily their personal rubrics but the general goals). The summary activity in Week 5 called “Looking Back, Looking Forward” should include meaningful reflection on their participation and learning goals and the identification of selected area for application of learning or future areas of growth. They will be encouraged to consider the relationship between their self-assessment of their participation and what it means – not only to their future work with online learners but to their own progress towards the achievement of their learning goals in the course. – emphasize the development of online facilitation skills in general ways throughout the course and then include a final activity to encourage participants to develop their own personal rubric to self-assess and continue to develop their online facilitation skills and their ability to facilitate group work or team work online. I’m going to propose we award some badges for performance (as we can’t award grades) – participants could select the level they believe they have achieved and explain why they chose a particular level for each badge? Minimum criteria would be active participation throughout the course?? I’ve still got to get feedback from my co-facilitator but I’ll put it on our GoogleSheet for open discussion and post a link to this blog post in the discussion forum. 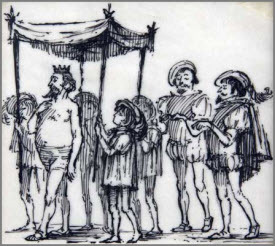 Did you ever hear the story about the emperor’s new clothes? Well, there is a certain sense of being naked when you start to share your course outline and publicly engage in revising, improving, tearing it apart. Thanks to Gabi Witthaus, Brenda Padilla, and Jeff Stanford and the Storyboarding OOC (open online course – not massive 😉 they are currently coordinating and facilitating so well, I`ve been sharing my attempts to re-envision, refine, revise and repair an online facilitation skills course I`ve been co-facilitating with Sylvia Currie of SCoPE over the past year. We`ve had the luck to inherit (share) an OER resource originally developed by the talented instructors at Royal Roads University, based on the principles of the well-respected ISW (Instructional Skills Workshop) model. We`ve tweaked it on the run and tried to stay true to the original learning outcomes and vision but I had been starting to feel like we needed to revisit them to ensure that our updates were still accomplishing what we intended or hoped. If you haven’t explored these tools, they’re all useful in different ways. We initially chose Popplet because we loved the visual approach, but I’ve since reverted to GoogleSheets for detailed editing of our overly-long learning outcomes. I’ll switch back to Popplet to think about our design visually – always get new insights that way. So, despite my best efforts I’m about a week behind. Luckily I saw Gabi’s post encouraging us to continue working at it, even if we’re behind. Just going to finish up Week 3’s assessment plan today. I really want to get caught up so I can get the benefit of a broader (and deeper) look at our learning activities. It has a range of titles: “Designing ICT-based Learning Activities” or “Design Studio for ICT-based Learning Activities” or “Hands On MOOC pilot 3”. They can be forgiven the fluctuating course title when you consider the task they have taken on: facilitating a MOOC with 7 language groups over a period of 5 weeks using a model of design adapted for the needs of higher education. I have experienced some serious discomfort with the amount of personal information they seem determined to collect and I dislike the legalese and sign-offs required to participate. I just get a vivid image of some academics rubbing their hands in glee as they watch waterfalls of data come flowing down the Internet pipeline. So much data, so many possibilities for future publications or edtech start-ups. However, I’m still hoping to learn more about the European perspectives on online education and to tuck some new strategies for developing meaningful learning activities into my back pocket. So, I guess it’s worth becoming research fodder. I’m impressed by the Canvas environment – nice clean design and lots of functionality that I could see liking if I were teaching in a “walled garden”. I particularly like the listing of activities which constantly updates to keep me on track and tell me if I’ve been successful at the various learning tasks in the first week (not always that easy to be sure you’ve done it right without a fair bit of clicking and scrolling). Another “aha” moment for me was when I realized that they have integrated storytelling and scenarios into their design approach. I’m just heading into Week 2 and the focus is on “personas” and scenarios. Looking forward to trying this approach – we’ll see if it really helps me to design better learning activities online. Now, to try and catch up on some of the readings and to find the time for peer reviews! What is this thing called the World Wide Web? What are the values and ambitions that gave rise to its design? If “the medium is the message,” what is the message of the web? What are some threshold concepts that help us to understand what is meant by “the web”? How is it reframing learning and education? What do we stand to lose or gain in pursuing the possibilities opened up by the web?. Here’s the link to my Prezi with some sketches and quotations and questions that represents my exploration – I still want to process some more before I explore some of the dissonance I felt when I really thought about the enthusiastic and positive statements of the group. Jonathan Worth, award-winning photographer, Coventry University professor and leading teacher of open-learning photography courses, including Phonar Nation. I enjoyed the examples (ideas) presented as to how to explain to students the benefits and risks of participating in an open, connected learning environment. I had discussions with concerned teachers at a spring conference in Kamloops (CNIE2014) who wondered whether their students were ready to learn in the open. While they could see the value, they were concerned about exposing students to risks that they didn’t feel they could foresee or control. There was a lot of discussion around the need for learning in protected, safe spaces as a way to provide the freedom and confidence to “play” and experiment. I still don’t fully understand what is meant by “leaky networks” ( a concept enthusiastically presented by Nishant Shah) and unintentional (unpredicted?) 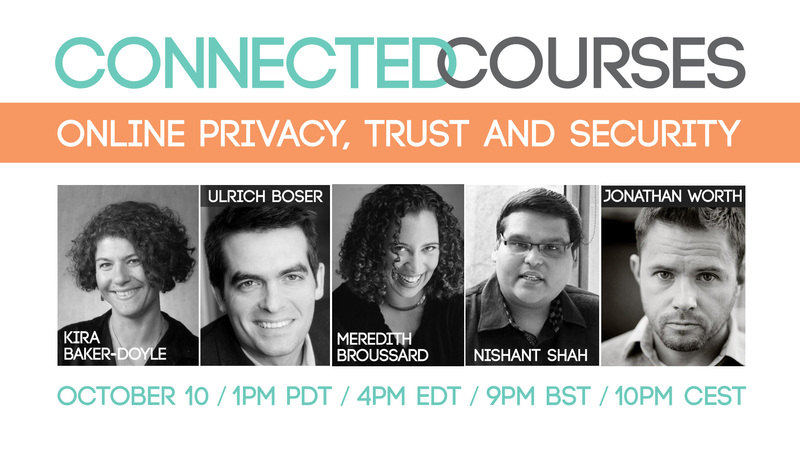 learning that occurs because of the exchanges you participate in as you participate in the network? I’m in a quandary as to whether I should just go through the stuff I’ve missed in Section 2 (which I’m really interested in) or start out with a renewed focus and commitment to Section 3 (which I’m also interested in). I am taking this course for my own knowledge and learning and I don’t like leaving interesting resources unread or unviewed. On the other hand, part of learning in a connected environment is keeping up with the flow, the interaction between all these fascinating new people in my learning network. What to do…mmmmm? Note to self: Find a better way to keep on top of the fragments of connected courses. It took me several tries to find the link to the actual recording of the Google Hangout event from Oct 10. I had it in my Google Calendar before, but it disappeared once the event was over. When I went to the list of readings and resources for the section, it wasn’t embedded there (at least I couldn’t see it). I finally found it by looking in the Calendar. 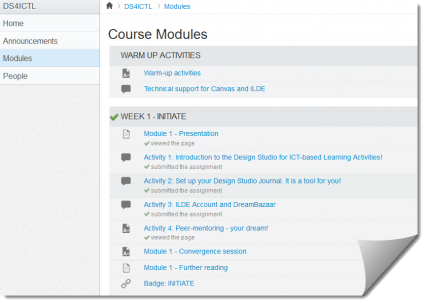 Implication for my development of a connected course – embed a touchstone area where a learner can go to find the important pieces – and include a navigation activity in the first section? The discussion focused on turning the traditional approach to course design upside-down. Instead of thinking about what we want to teach and then looking for content to develop a course, perhaps we should begin from WHY? Why should we teach this course? Why should student learn with us? An interesting shift in perspective for a teacher, potentially valuable to students, but I still question the potential for change in an increasingly outcomes-driven education system. Although dedicated, experienced teachers like these three panelists are open to exploring the “why”, the pressure on schools (and on teachers) from parents, government funders and the business community is to make education more “relevant” and “meaningful” in terms of work, not in terms of citizenship or creating a more enlightened and empowered individual. Although I found many nuggets that I have squirrelled away for further exploration, contemplation and sharing, some of the most thought-provoking comments for me came from Michael Wesch and Randy Bass. Randy spoke about the need for providing safe spaces through balancing structure and freedom so that students could feel free to take risks and be creative. He described the intimate learning spaces of the atelier-style course he taught “where you can model what it looks like to give and get critique”. He acknowledged that students may not have the social capital or comfort with being critiqued right away and needed a chance to see how it worked, practice it in a protected way before venturing out into the “connected classroom” environment where they might face “criticism from all directions”. That really resonated with me as I’ve found that many of the teachers I’ve taught have felt very exposed and vulnerable if they thought that what they said or did could be viewed and perhaps misconstrued from people who didn’t understand the context. A valid concern and one that is rarely addressed in the open education and open educational practices discussions I’ve been part of. Michael Wesch embraced the power of openness and talked about the value of creating creative open learning places where the instructor could facilitate student creativity by “putting yourself out there”. He cited ds106 as an example and encouraged people to find “…your authentic self and take a few chances so other people can take chances”. He pointed out that a lot of learning in an open course can take place on the fringes, where we, as instructors, may not be able to see or monitor what is going on. But learning happens when people form new connections, whether orchestrated by a curriculum and a teacher or more naturally as people play and explore new ideas. I like the sound of that although I still have concerns about how that works in a outcomes-driven institution where students are trying to earn credits that will be recognized by potential employers. I keep hearing Grace Jones singing in my mind….”Yes, I’ve done it again, done it again, done it again…” I couldn’t resist signing up for the most open course ever…”Connected Courses: Active Co-learning in Higher Education” sponsored by DML Hub and the opening salvos are from Jim Groom (Click), Alan Levine (Link) and Howard Rheingold (Embed)! Check out the topics and line-up of leaders – some of the edupunks I’ve been following for years – always interesting, often inspiring.